2010 Recap: Donovan McNabb always liked his tight ends, and two years ago Brent Celek led the Eagles in receptions with 76. The switch to Kevin Kolb, a quarterback with a weaker arm, was supposed to bolster that relationship even more. That’s why the Eagles gave Celek a six year, $30 million contract extension in 2009. But things didn’t quite go as planned. 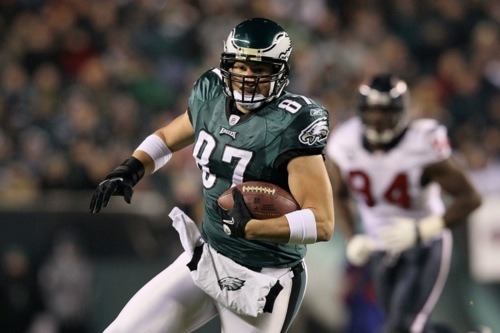 Last year, with Michael Vick at the helm, Celek became an afterthought. His role as a blocker increased from 14 percent of pass plays to 22 percent and his targets dropped from 111 in 2009 to only 77 last season. As the wide receivers take over, receptions from the tight end spot have become less important — and Celek’s numbers dropped accordingly. Clay Harbor, a rookie, picked up the back up role without much problem — although he wasn’t asked to do a lot. It did seem like his blocking was improving by the end of the season though. Garrett Mills, who the Eagles promoted from the practice squad midway through the season, was the only other tight end to catch a pass. 2011 Depth Chart: Celek and Harbor seem set in the first two spots, which will likely be the only ones that matter. Two other players will serve as token competitors to Harbor. The first is a familiar face, Cornelius Ingram, who the Eagles drafted in the 5th round of the 2009 draft. Ingram was cut last offseason after a rookie year lost to a torn ACL, and then brought back on the practice squad at the end of 2010. The other player is John Nalbone, who was selected by the Dolphins just eight picks after Ingram in 2009 but never caught on their either. Potential Additions: I honestly don’t see any reason the Eagles would add another tight end this summer. They seem to think only two tight ends are necessary for the active roster, and there are already four in camp. Unless the coaches are more in doubt about Harbor than we thought, he should be pretty safe. Future Outlook: Celek’s signed until 2016. The biggest thing to look at long term is how Harbor progresses. Will he have to permanently compete for the back up job, or does the team think might he has the talent to stick around after Celek? Tagged with Philadelphia Eagles, Tight Ends, Brent Celek, Clay Harbor, Cornelius Ingram, John Nalbone, Michael Vick, Wide Receiver, Targets, Receptions, Blocking, Garrett Mills, Offseason, 2011, NFL Draft. April 11, 2011 by Brian Solomon.